Although the Go2 synth plug-in may seem more basic than our other synthesisers Rob says that "it still has some unique features and sound, which makes sure that it will boldly go to where no other synth in this category went before..."
The current Rob Papen collection contains synthesisers which have many features and types of synthesis which sometimes can be a little daunting to the average user. But with the Go2 there is always something tempting and fun with something that is so simple! Compare it also whilst making music, very often less is more and this is also can be applied whilst using synthesisers. Sure, with a heavily featured synthesiser, you can also be less complex in a patch. But this often still takes more time to achieve. Commands (XY Menu with the many additional options like a preset path). In Unison mode, Go2 plays up-to 4 unison voices, for each note played. This works at an oscillator/filter level, so you can still play up-to 16 voices in poly mode. Exp Env (Selects if the envelopes decay/release stages are linear or have an exponential characteristic). 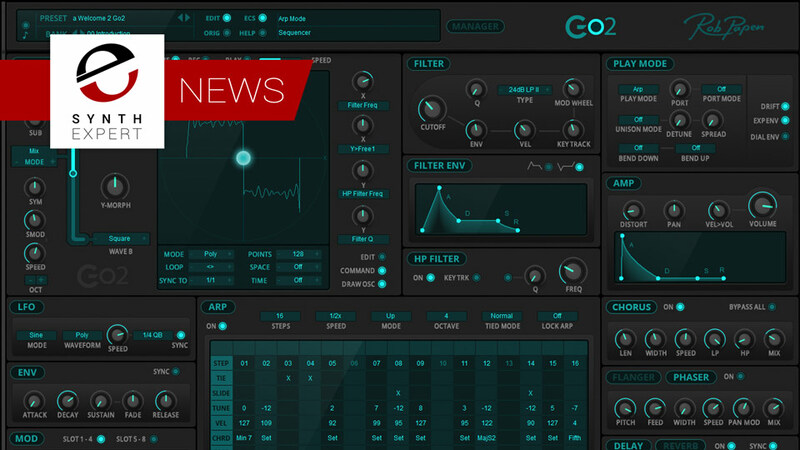 Go2 offers a classic style Arpeggiator with some unique features, like sequencer mode and unison/chord control per step. A click on the Go2 logo will display the back panel. The back panel contains several global controls that affect all instances of Go2. External MIDI Control Capture Mode. MIDI Program / Bank Change. Very soon to be compatible with the NI NKS system.